Tomato soup has to be my all-time favourite. I think it goes back to the Heinz cans of tomato soup of my childhood, delicious on a cold winter’s day, even out of a Thermos flask. We never had home-made soup when I was a child, yet I’ve always prepared my own ever since I first started cooking in earnest and there really is no comparison! It’s so easy too, just a case of browning off your vegetables, adding (good) stock and away you go. I love to stock up the freezer with tomato soup, as the tomato season here in Britain is so short, especially when you’re growing them without a greenhouse. I confess I do cheat and make tomato and lentil soup or minestrone with tinned tomatoes in the winter months, but for me the best tomato soups are those made in the fleeting months of August and September, when fresh, juicy tomatoes come straight off the vine. I don’t have a huge crop of tomatoes these days, and I do favour the cherry varieties like Sungold and Gardener’s Delight which I love to eat just as they are for their incomparable, sweet taste. This year, like last, I’ve also grown the stripy Tigerella, a small standard tomato, which is delicious cooked in soups and sauces, and lends itself to growing outside too. However, I don’t grow nearly enough for full-scale soup production and I’m very lucky this year to have been given bags full of huge, ripe tomatoes by friends with a smallholding and a very large and productive glasshouse! I can never decide on my favourite tomato soup recipe and have three in contention – so I usually make all three at some point and fill the freezer accordingly for the darker days ahead. They are Delia’s Roasted Tomato Soup, which has a divinely rich and concentrated flavour, but uses a lot of tomatoes for a relatively small end quantity; Tomato, Apple & Celery Soup, another of Delia’s recipes, which originally came from the legendary John Tovey of the famous Miller Howe restaurant in the Lake District; and a simple Tomato Soup made in the slow cooker, originally taken from my very old Tower Slow Cook book. I’ve adapted them slightly, as ever. See which you prefer! 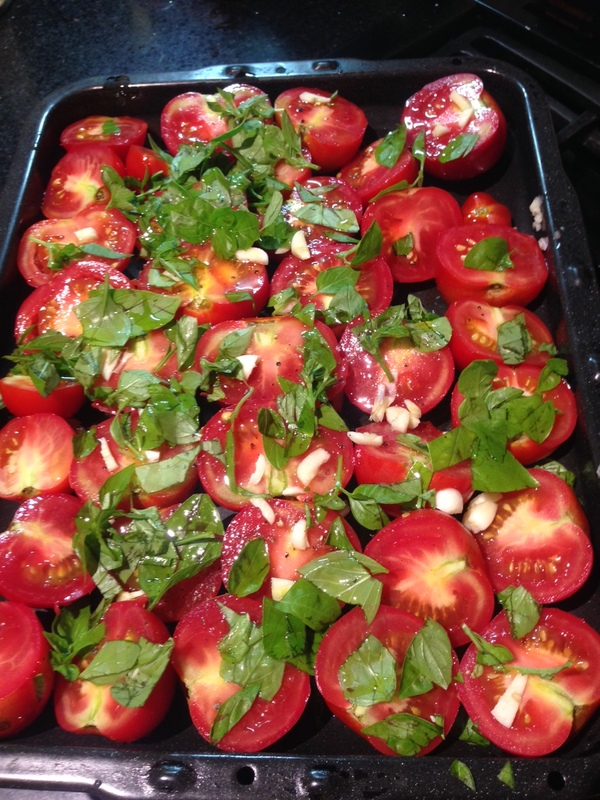 Cut the tomatoes in half and place cut side uppermost in a large roasting tray with the onion cut into chunky wedges. Sprinkle the roughly chopped basil leaves and chopped garlic on top, season and drizzle with olive oil and balsamic vinegar. Roast at 180°C fan (Gas 5) for 50 minutes to 1 hour until starting to brown at the edges. In the meantime, place the chopped potato in a pan with the boiling water or stock and tomato purée, and simmer until the potato is cooked – about 20 minutes. When the tomatoes are ready, scrape the contents of the roasting tray into the potato pan and purée the lot in a liquidiser in several batches. I’ve doubled Delia’s recipe here, as I found the original only ever made enough for three – perhaps I’m just greedy or maybe we have bigger appetites these days? You can now sieve the soup if you wish, or leave it as it is if you don’t mind the slightly chunky texture. It will be even chunkier if you use a hand blender or food processor rather than a liquidiser, but none the worse for that. Serve with good bread and savour the deep, rich taste – mmmmmm. The next soup is ideal if you don’t have huge amounts of tomatoes to play with, as it uses equal quantities of apple and celery and gives a really fresh and vibrant flavour as a result. I always have plenty of windfall apples lying around at home and at the allotment this time of year, so it’s definitely on my must-cook list. Once again, I’ve doubled the original quantities – it’s really no effort to make more, fills my trusty Le Creuset casserole and makes plenty for the freezer. This soup is a much lighter colour than the other two, probably because of the apple and celery content. Melt the butter in a large pan, then add the chopped onions and garlic and cook gently until golden – about 10 minutes. Add the prepared fruit and vegetables, sherry, spices, thyme, tomato purée and seasoning, then place a double thickness of greaseproof paper, dampened with cold water, over the contents, cover with a lid and simmer gently for 1 hour. This method of cooking keeps in the flavours and allows the vegetables to cook really slowly; I’ve never found that it sticks, but you might like to check from time to time in case your heat source is particularly fierce! After 1 hour, add the stock to the contents of the pan (removing the paper first, of course!) and stir thoroughly. Bring back to the boil for a few minutes, then allow to cool. Liquidise the soup in batches and then you will need to sieve this soup, as it contains all the stalks, pips, etc! Return to a clean pan and reheat. Serve with good bread or cheese & apple scones. So fresh! My final tomato soup recipe is made in the slow cooker for convenience, but you could equally well cook it on the hob for 45 minutes – 1 hour after the initial preparation. I often make it overnight, then it has time to cool before being liquidised for lunch. In my original recipe book I’ve noted down to add flour – how times have changed! I wouldn’t dream of adding flour to a soup recipe these days, but tastes were obviously different back in the early 80’s. Another sign of the times was the addition of dried mixed herbs – I really can’t remember the last time I didn’t use fresh herbs in a recipe, but they just weren’t as available in the shops 30 years ago… It works perfectly well with dried herbs if that’s all you’ve got to hand, of course, but fresh are definitely better. This recipe also includes bacon, which I think gives it a nice savoury flavour, but you could always leave it out and use vegetable stock if you’re cooking for vegetarians. 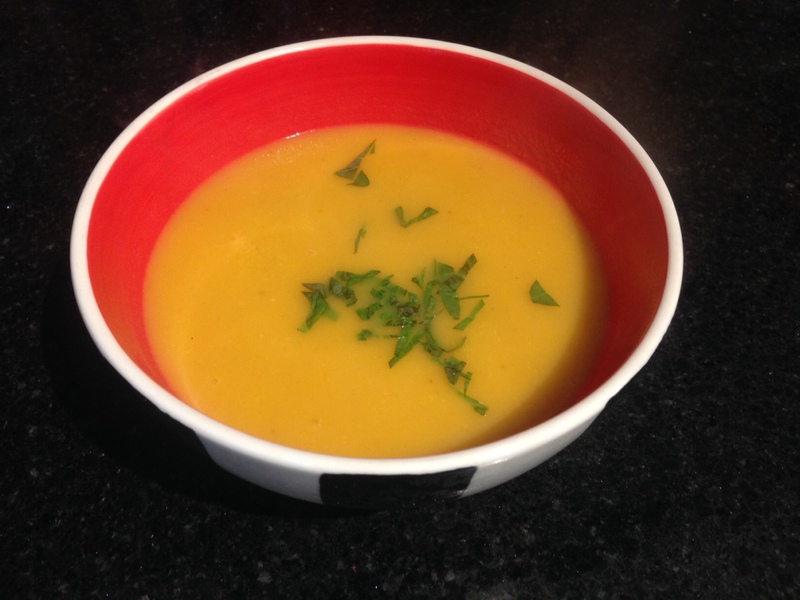 It makes quite a thin, but delicious soup, since most of the vegetable content is rather watery; if you’d prefer a thicker soup (and trust me, flour is not the way to go! ), just add a medium potato, peeled and diced, with the rest of the vegetables. Alternatively, you could add cream at the end for a cream of tomato soup. If using a slow-cooker, pre-heat on high if necessary. Heat the butter or olive oil in a large pan and cook the onion, garlic, carrot, celery and bacon gently for 5 minutes until starting to soften. Stir in the remaining ingredients apart from the stock and cook for a further 5 minutes, then add the stock and bring to the boil. Transfer to the slow cooker if using and cook for 8 – 10 hours on Low – or overnight. Otherwise, turn the pan down to a simmer and cook for 45 minutes to 1 hour. Remove the bay leaf, allow to cool, then liquidise in several batches. (I say this advisedly – I once asked my teenage son to liquidise some soup for me, but he didn’t read the instructions, didn’t allow it to cool and poured it all into the liquidiser in one go. Result: one extremely messy kitchen – not a pretty sight!) Again, you can sieve if you feel it necessary, but I don’t usually for this one. Once again, serve with good bread and enjoy the taste of summer! 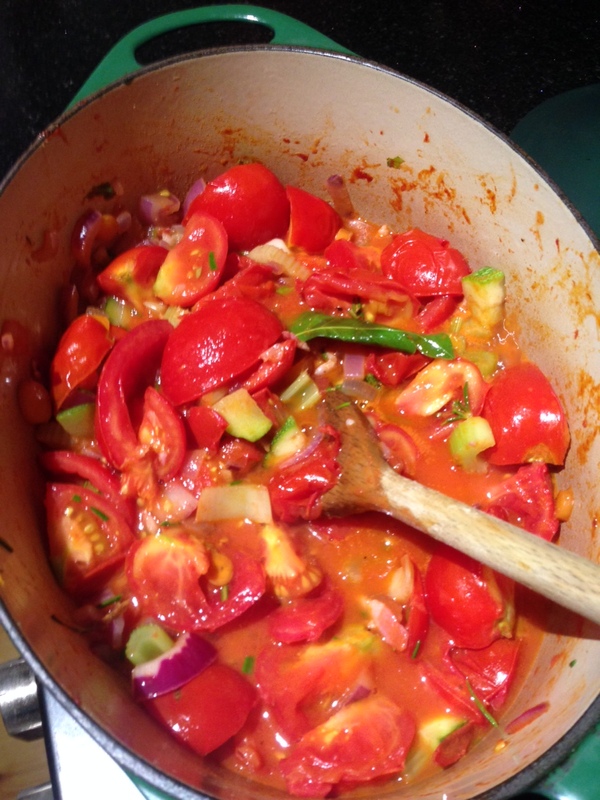 Previous PostFeast of plentyNext PostGoodbye to courgettes….